Zotac ZT-62AA250-HSS applies nVidia 6200A chipset which supports native AGP8X. 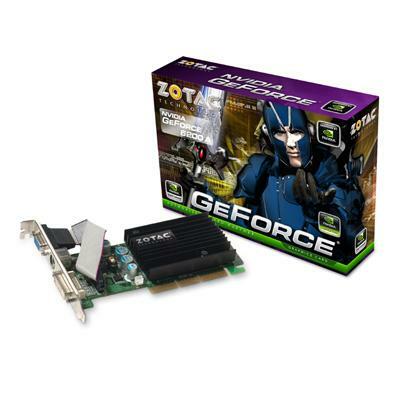 It supports DirectX 9.0 and Shader Model 3 which suitable for entry level gaming machine at low cost. Powers the next generation of cinematic realism. Full support for Microsoft® DirectX 9.0 Shader Model 3.0 enables stunning and complex special effects. Next-generation shader architecture delivers faster and smoother gameplay. Provides double the bandwidth of AGP 4X-2.1GB/sec. vs. 1.1GB/sec. AGP 8X enables more complex models and detailed textures, creating richer and more lifelike environments. Uninterrupted data flow allows for smoother video streaming and faster, more seamless gameplay. Able to drive the industry's largest and highest resolution flat-panel displays up to and including 1900x1200.